Much of my reading this week was playing catch up with some books that I started, but hadn’t finished (yes, I have the masochistic habit of reading several books at once). Men at Arms was just as funny and enjoyable to the end as it was in the first half. And this morning I finally got around to finishing that autobiographical tome, A Drifting Life. The ups and downs of Hiroshi’s creativity and motivation don’t stop, even at the last pages, and while that’s a little bit terrifying (so wait, you mean I will never have utter confidence in myself?) it’s also inspiring, giving me a sense of writerly comradery. This manga is definitely going on my mental shelf of books and movies that inspire me to write. 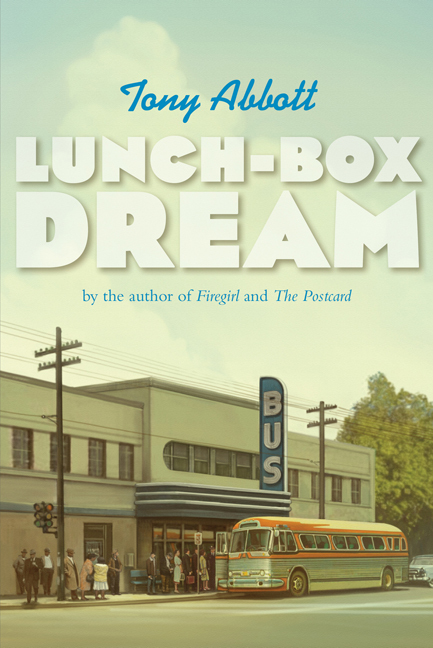 I also started, and finished, a young adult novel by my current Lesley mentor, Tony Abbott: Lunch-Box Dream . Taking place in the 60s, the story follows Bobby and his family as they take a road trip to Florida, stopping at Civil War battles on the way. But we also see chapters from the point of view of various members of a black family in Atlanta, who Bobby and his family don’t meet encounter until the last chapter. It’s amazing how he captures all the different voices; he does something very interesting, where Bobby’s story is in third person, while the black family’s story – and at one point his grandmother’s story – is from the first-person perspective of varying characters. At the end, I’m not sure what Bobby learned, or what will happen when he returns home, and that left me feeling a little wanting when I was done, but all the way through it was an intense, absorbing read. I am so very lucky. Books that I’ll be getting into this week include Waiting for Normal , and a really awesome looking graphic novel, Stitches.